Hello all, just a short post to tell you about an exciting big step in my writing career. Last afternoon (2/27/17), there was a pleasant surprise as my brother Travis informed me that a package arrived for me. 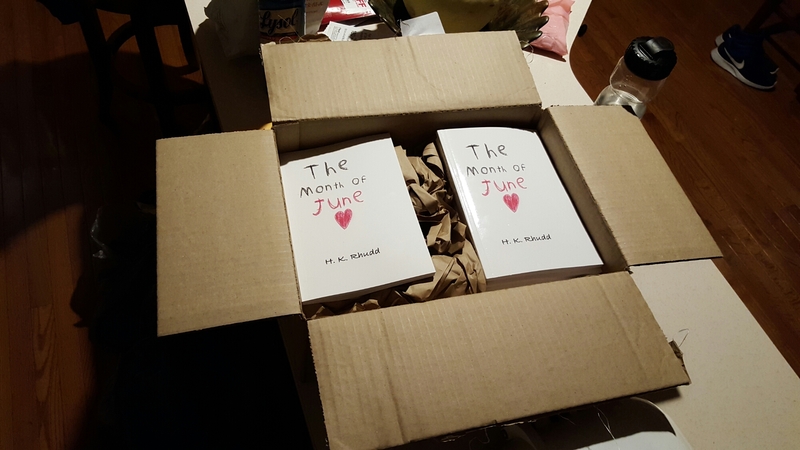 I opened it and discovered that it turned out to be my first ever shipment of my book, The Month Of June! It’s a surprise since I expected it to arrive on March 7th, as the website projected. But now that they’re here I can get to selling them sooner, and be able to get more money to then put into buying more books. This really is a milestone for me. This started out as just a story I worked on in my notebook on my free time. And to finally see it materialized in front of me like this is amazing, and shows just how far I’ve come. You can grab your own copy of The Month of June, too. All of the information about it is right here, with links to different purchasing options at the bottom.